What a great school year! Are you ready to celebrate? Before you sleep in or turn on the long summer of television programs, plan a little End of the Year Reward! In the professional world employees usually are given raises or bonuses for hard work. They might be acknowledged with prizes or other recognition. Reward your students and reinforce the idea that their hard work means something. 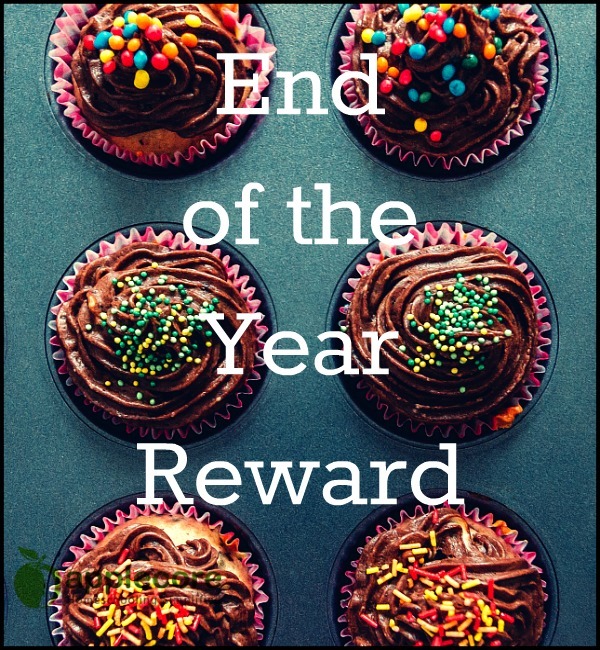 End of the Year Rewards do not have to be extravagant. Plan something simple, meaningful, and show appreciation for the hard work your children have put forth. We often cook our children’s favorite meal (tacos) and say a few things we are proud they accomplished. Give them a round of applause for learning to read, mastering multiplication, finishing that long paper, winning the science fair, or acing their SAT! We have rewarded the “last day of school” with a new comic book or movie. What fun to wrap up the day with a movie, their own root-beer and bag of popcorn! You might even plan an end of the year field trip. We finished one homeschool year with a trip to Legoland. It was the best day ever for my lego loving boys. Maybe get together with other homeschool friends and plan a picnic. Bring some balloons and cupcakes. Personally, we do not pay for grades. But if that is an agreement in your home – open up the wallet and pay for those A’s. My best advice, however you decide to enjoy the end of the year reward – plan it before the last day of school!